Top (left to right): Lydian Johnson, Mia London, Lisa Garby; Middle (left to right): Shannon Holness, Dami Lateef, Jessica Polley; Bottom (left to right): Carla Navida, Keosha Dwyer, Talisha Ramsaroop, Will Wallace. The ONE City Scholarship Fund congratulates all of Toronto’s high school graduates this spring on reaching this important milestone in their education. “These are individual achievements, but they are also achievements for the students’ families and communities,” says Will Wallace, Chair of the ONE City Scholarship Fund. “In addition, these achievements represent the very real potential for Toronto to grow and develop,” he continues. “We cannot underestimate the capacity of the young people who are graduating high school this spring; they are remarkable,” says Monica de Jersey, a teacher at Downsview Secondary School and a founding member of ONE City. In that spirit, ONE City is happy to announce the awarding of four $2500 scholarships to Toronto District School Board students who are graduating this spring. Their examples demonstrate the astonishing resilience, tenacity, optimism and brilliance that are characteristic of so many of the young people graduating in all areas of Toronto. The four winners have faced obstacles and yet have excelled. Each of them has demonstrated their understanding that their success is closely tied to making contributions in their community. “With young people like this in our city, how can we lose?” says Wallace, a teacher at Downsview Secondary. The ONE City Scholarship provides financial and moral support so that winners can work a little less and focus on their studies and the other aspects of post-secondary life a little more, providing them the opportunity to continue their pursuit of excellence. This is the first year for ONE City to provide scholarships. “We were blown away by the level of commitment and dedication of all the candidates, and especially our four winners,” says Lisa Garby, a teacher at Central Tech, and also a founding member. The winners are Esmat Sahak and Hajar Seiyad of Marc Garneau CI, Nathan Devlin of East York Alternative, and Naqeeb Barak of Jarvis CI. The ONE City Scholarship Fund is an initiative of TDSB educators and their community partners in support of remarkable students. ONE City encourages all educators to join to build the Fund. Its mandate includes supporting students with scholarships and other supports, communicating with the broader Toronto community about the awesome potential of our youth, and letting Toronto’s youth, especially those from challenging backgrounds, know that we want them to succeed. The Fund is administered by Toronto Foundation, a community foundation that enables the philanthropy of individuals, families and groups across the city. The ONE City Scholarship Fund is supported by Toronto Foundation for Student Success and is led by educators. Our First Ever Winners. Read Their Profiles! ONE City Celebrates Toronto’s Best Good News Story! The ONE City Scholarship Fund is run by educators who want to celebrate the remarkable young people graduating from Toronto high schools, especially those who find a way to overcome major challenges and excel. As part of our celebration, we are offering this year four scholarships of $2500 to four very deserving young people, who exemplify what is best about Toronto’s youth. Below, please find the profiles of the four winners of the first ONE City Scholarships. We are so excited to share their stories with you. We are so lucky to have these fine young people growing up in our city. They have overcome so much and have already made important contributions to their communities. They are shining examples of the thousands of young people who have committed themselves to building positive lives in Toronto, even while they have had to face so many obstacles. Toronto talks about ‘Diversity our strength’, but we can all do more to recognize the vast potential of our young people, especially those who have faced challenging circumstances. In so many instances, they have faced hardship and found in themselves resilience, optimism, and creativity. They embody the key to the best of Toronto’s future. ONE City Scholarship Fund Fund is administered by Toronto Foundation, a community foundation that enables the philanthropy of individual, families and groups across the city. 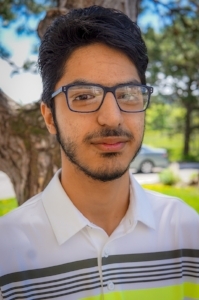 Esmat Sahak is an exceptional student who is heading to University of Toronto to study Engineering Science. His teachers at Marc Garneau Collegiate Institute are so enthusiastic about him. He is collegial, a mentor to younger students and has a strong social conscience. He sees problems as opportunities. He is already planning to build drones that don’ t drop bombs but deliver medicine instead. His family moved from Afghanistan and settled in Flemingdon Park before he was born here. Esmat and his family have faced the challenges of being new to Canada, but no obstacle has kept him from building towards a life that is full of promise and achievement. Hajar Seiyad, who attends Marc Garneau Collegiate Institute, has a deep independent streak, and yet she is committed to others. 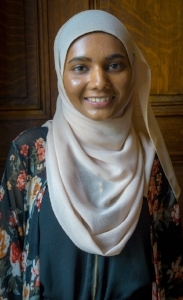 As a child of Sri Lankan immigrants who did not have the benefit of an extended education, Hajar, understands the value of the opportunities she has been given. Her keen observation of others has allowed her to see the great need for positivity and grit among the youth of Flemingdon Park. She has volunteered in many areas of Mental Health and will be studying in this field at the University of Toronto, Scarborough Campus next year. She has been particularly interested in academic achievement and self-esteem; after volunteering with community tutoring and facilitation initiatives, she has begun her own tutoring service for students six to fifteen. Naqeeb Barak, who attends Jarvis Collegiate, is proud he lives in Regent Park. What he has experienced there is a community that is inclusive, supportive and warm. He has used this positive environment to develop his own leadership. He arrived in Toronto at the age of 11 to rejoin his family who had emigrated earlier; he and his family had spent years in Pakistan after fleeing there from Afghanistan, leaving everything they had owned, including the farm that had been in the family for generations. Naqeeb spoke no English when he arrived here. A mere six year later, Naqeeb has seized the opportunities he has been given, become fluent, and immersed himself in organizations that support others: Me to We, Muslim Students Association, Mental Wellness Club, LGBTQ Club, Pathways to Education, Muslim Welfare Centre, Christian Resource Centre. He is planning to pursue a Bachelor of Science. Nathan Devlin, who attends East York Alternative, has gained admission to OCADU to pursue illustration after a very positive portfolio review earlier this year. Through his art he is committing himself to communicating the experience of LGBTQ teens; he has contributed to three murals for his school and has helped curate, install and promote several art exhibits for at-risk youth at the Gladstone Hotel and XSpace Cultural Centre. Not only is Nathan the first in his family to attend post-secondary, he is also the first in his family to finish high school. He is a poised young man who is embracing the possibilities that await him. This post is my annual appeal to you to support the ONE City Scholarship Fund. For the past two years, we have been building our funds with your support to the point- now over $25,000 - that we can provide our first scholarship this spring. Wow! Thank you. This amount allows us to get started, but I am asking for your support to allow us to broaden our reach and impact. You know that I am more than a little passionate about this project. I have the honour of teaching some remarkable students who are overcoming major obstacles to find a way to excel. My teaching colleagues across the city share my experience. Our students' optimism, ingenuity and resilience are astonishing, and bode well for Toronto in the future, if we support them today. 3. Send a message to the youth of this city who are facing huge challenges, that there are many people who are in their corner and want them to succeed. Call me selfish, but we need these young people to excel. I worry with the broader forces that are pulling Toronto to greater inequality that we will not fully benefit from their potential. The idea of hindering the talent they hold within them appalls me. Inequality is not inevitable; it is ultimately a choice. At the same time, building an equitable Toronto requires effort. The ONE City Scholarship Fund is a part of that effort. I hope you will join me. When we reach across the borders that divide us, we become one city. Please click on the link to be taken to our website and then to a secure page at the Toronto Foundation, our supporting partner, to make your charitable donation. P.S. Please check out this short video, highlighting the fact that in spite of the new OSAP, students from challenging backgrounds are still working to the point that it detracts from their studies. Thanks to Tamana and Dami for sharing their reality and for Matt Chapman for creating the video. One City Fund: JOIN US! Teachers and community members in Toronto supporting students from poor backgrounds who have excelled academically. Post-secondary scholarships will be substantial and multi-year. Visit onecityfund.com to learn more. When we reach across the barriers that divide us, we become one city! Downsview staff, past and current, joined by teachers from Victoria Park and William Lyon Mackenzie, gathered recently to play a little euchre and talk about the One City Scholarship Fund in celebration of the successful end to the semester. The tournament was intense, loud, competitive and filled with laughter, fueled by the incomparable baking of Monica de Jersey.